At FV-Plast, we develop new materials to offer our customers not only the most modern, but also the most efficient solutions. These include our latest product. We would like to present one of the most modern, unparalleled pipes, FV PP-RCT UNI. 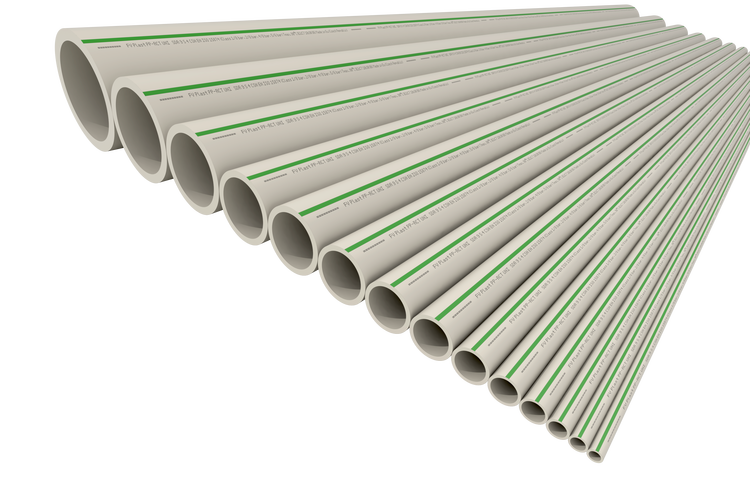 Thanks to the modern PP-RCT material, PPR pipes have new features. The basis is the β-nucleation process that greatly improves the crystalline structure of polypropylene random copolymer PP. This allows the pipes manufactured therefrom to operate at higher wall pressure in the pipe even at elevated temperatures, with the same or lower thickness of the wall of the pipe. Drinking and hot water distribution systems in all types of buildings. Industrial cooling water distribution system. Another advantage of PP-RCT is the favourable life curves (isotherms). They are always linear along the entire length, while in the case of PP-R materials there occurs great reduction in pressure resistance and service life of the pipes at a temperature of more than 70 °C.